Welcome to this fantastic book containing a choice collection of brain-teasing word definition puzzles! Packed with 150 questions, this book is great for when you're on the go and have a quiet moment to spare. Printed in a 5x8" inch book, it's perfect to pop in your pocket or bag. 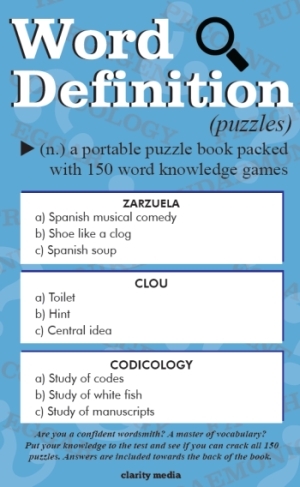 Not only will you test your current knowledge, these puzzles are sure to expand your vocabulary and teach you many new interesting words. Questions are presented 3 per page, so the text is nice and clear for easy reading. 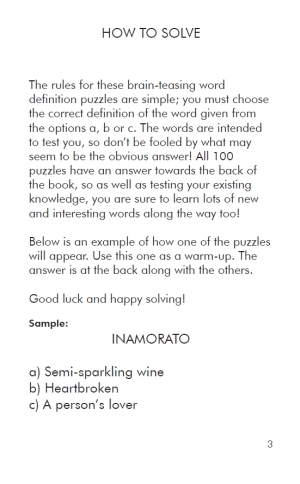 Solutions are featured towards the back of the book so once you have answered all 150 puzzles, take a peek at the answers to check the definition. Below are a couple of sample questions for you to try. If you enjoy these, there are plenty more weird and wondeful definitions for you to learn in the book! The answers are: A, C.
Bonus points if you manage to throw one of the words into your next conversation and see the raised eyebrow in response as your erudition shines through!